Brad Goodspeed: "Here's an animation I did to make you feel small. While watching the video of the lunar eclipse I posted the other day I was looking at the curvature of the earth's shadow on the moon. It made me think about how large the earth might look if an exact copy of it was up there instead of the moon. Soon curiosity got the better of me, and I was animating!" When astronomer John P. Huchra passed away in October 2010, his friends and colleagues at the Harvard-Smithsonian Center for Astrophysics (CfA) sought a way to honor his research and teaching legacies. 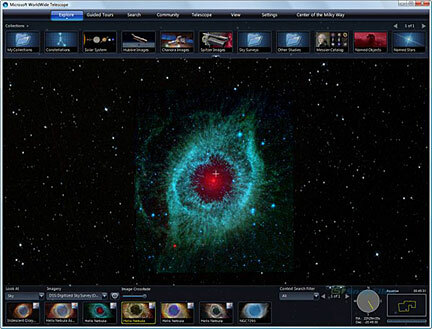 One way has been the creation of a new interactive WorldWide Telescope (WWT) tour, "John Huchra's Universe," which was unveiled at the 217th AAS meeting in Seattle, Washington, on January 11, 2011, and is now available online. WWT is a free and very powerful interactive astronomy program from Microsoft Research. 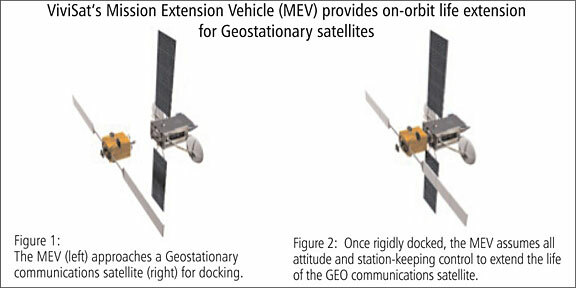 RSC Energia: "In the scope of operations for prelaunch processing of cargo transport vehicle (CTV) Progress M-09M under the International Space Station program small spacecraft - satellite Kedr was accommodated in the vehicle cargo compartment on January 18. The satellite is designed to carry out space experiment RadioSkaf: development, preparation and launch of supersmall spacecraft during extravehicular activity (EVA). The experiment investigator is S.P. Korolev RSC Energia. The launch of CTV Progress M-09M is scheduled to be performed on January 28 at 04:31 Moscow Time." NOTE: This email is for information gathering purposes. Willingness to participate in the SOI review does not guarantee a proposal will be assigned. The number of available qualified reviewers may exceed the number of reviewers needed. NASA Research and Education Support Services (NRESS) is seeking persons to evaluate proposals submitted in response to the NASA Cooperative Agreement Notice (CAN) titled, "2011 Summer of Innovation Project" announced by NASA Glenn Research Center Office of Educational Programs on January 19, 2011. Specifically, NASA is interested in reviewers with expertise and experience in one or more of the following areas: education reform and policy, evidence-based summer learning programs, innovative and scalable program design, partnerships, grant management and/or federal education proposal review. NASA is seeking reviewers with various backgrounds and professional affiliation including Pre-K - 12 teachers and principals, college and university educators, researchers and evaluators, social entrepreneurs, strategy consultants, grant makers and managers, and others with education expertise. The American Philosophical Society and the NASA Astrobiology Institute have partnered to promote the continued exploration of the world around us through a program of research grants in support of astrobiological field studies undertaken by graduate students, postdoctoral students, and junior scientists and scholars. NASA has formed a partnership with Spaceweather.com to engage the amateur astronomy community to submit the best images of the orbiting NanoSail-D solar sail. NanoSail-D unfurled the first ever 100-square-foot solar sail in low-Earth orbit on Jan. 20. To encourage observations of NanoSail-D, Spaceweather.com is offering prizes for the best images of this historic, pioneering spacecraft in the amounts of $500 (grand prize), $300 (first prize) and $100 (second prize). Space researchers at the University of Surrey and Surrey Satellite Technology Limited (SSTL) have developed 'STRaND-1', a satellite containing a smartphone payload that will be launched into orbit around the Earth later this year. STRaND-1 (Surrey Training, Research and Nanosatellite Demonstrator) is being developed by the Surrey team to demonstrate the advanced capabilities of a satellite built quickly using advanced commercial off-the-shelf components. Lockheed Martin plans to increase the affordability and efficiency of space system development with the opening of a new advanced technology and virtual simulation facility, known as the Collaborative Human Immersive Laboratory (CHIL). The CHIL, located at Lockheed Martin Space Systems Company headquarters in Littleton, Colo., integrates several virtual reality technologies enabling engineers and technicians to validate, test, and understand products and processes virtually before creating them physically. The result is a reduction in risk with savings in both time and cost. Spot LLC continues to pioneer innovation in satellite communications, bringing global messaging technology into the hands of millions worldwide. A wholly owned subsidiary of Globalstar, Inc. (Nasdaq:GSAT), Spot LLC today announced SPOT Connect, a new SPOT satellite communicator capable of sending messages over the Globalstar satellite network from smartphone operating systems. Winner of this year's CES Innovations Award in Design and Engineering in the Personal Electronics category, SPOT Connect will showcase this week at the International Consumer Electronics Show in Las Vegas. The Milky Way Project has been live since December 7th and is still going strong, taking data from the Spitzer Space Telescope and asking you all to help us map the galaxy. If you haven't tried it out yet, visit http://www.milkywayproject.org. The Milky Way project volunteers have collectively classified more than 116,000 images. This involved marking a whopping 141,000 bubbles, 5,000 possible galaxies and 15,000 star clusters! Those are the raw numbers. When we combine all the individual drawings we find that you have created a catalogue of about 5,000 unique bubbles between you. This is about ten times larger than the current best published catalogue! No Boundaries, a USA TODAY education initiative in collaboration with NASA, encourages students to explore careers in science, technology, engineering, and mathematics. Students explore STEM careers through stimulating project-based learning and team competition. 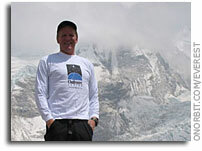 No Boundaries targets students in grades 7-12 and is designed as a team-centered cooperative learning project. No Boundaries is cross-curricular and requires minimal teacher preparation. It aligns to national standards and includes assessment rubrics. Students who submit their final No Boundaries career presentation projects to the 2011 National No Boundaries Competition are eligible to win up to $2,000 in cash awards for themselves and $500 for their teacher or sponsor. They will receive VIP passes to visit a NASA facility. Winners may be asked to present their work to NASA. For more information, visit the competition website. Link to the NES Virtual Campus home page. NASA's integrated technology roadmap, which includes both "pull" and "push" technology strategies, considers a wide range of pathways to advance the nation's current capabilities in space. Fourteen draft Space Technology Area Roadmaps comprise the overall integrated map. NASA developed the set of draft roadmaps for use by the National Research Council (NRC) as an initial point of departure for mapping NASA's future investments in technology. 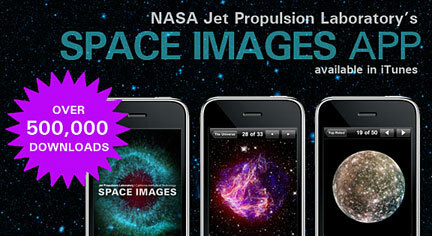 The first-ever NASA/JPL iPhone application, Space Images, has reached 500,000 downloads, just as JPL prepares to release its newest version of the free app. Space Images features breathtaking views of Earth, the solar system and the universe beyond. Soon after its release in January 2010, Space Images was selected as a "Staff Favorite" in iTunes and quickly became a top app in the Education category. It has since received praise from users for its extensive and stunning collection of images taken by NASA/JPL spacecraft and for its educational uses. Friday, Jan. 21 at 10 a.m. EST, engineers at NASA's Marshall Space Flight Center in Huntsville, Ala., confirmed that the NanoSail-D nanosatellite deployed its 100-square-foot polymer sail in low-Earth orbit and is operating as planned. Actual deployment occurred on Jan. 20 at 10 p.m. EST and was confirmed today with beacon packets data received from NanoSail-D and additional ground-based satellite tracking assets. In addition, the NanoSail-D orbital parameter data set shows an appropriate change which is consistent with sail deployment. AO Number (Required in subject line of email application): 823. 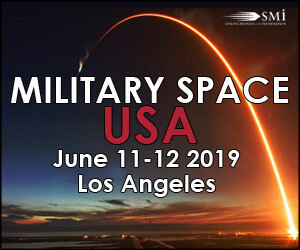 Desired Number of Participants: 1 Background Information: The Deep Space Network (DSN) is composed of three spacecraft tracking centers in California, Spain and Australia. Each center tracks spacecraft up to the far reaches of space 24 hours/7-days/week and is manned by human operations. Some of the protocols and operations concepts are shared by other space agencies. The Consultative Committee for Space Data Systems (CCSDS) promotes the use of shared approaches and protocols to enable spacecraft operations support across agencies from multiple countries. AO Number (Required in subject line of email application): 799. 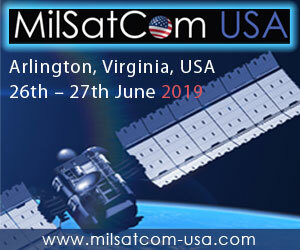 Desired Number of Participants: 1 Background Information: The Deep Space Network tracks over forty spacecraft from three geographically separate sites in Goldstone California, Canberra, Australia and Madrid, Spain. NASA has opened online voting for the agency's OPTIMUS PRIME Spinoff Award student video contest. The public is invited to vote for its favorite videos, made by students in grades three through eight, developed to help educate America's youth about the benefits of NASA's technologies. NASA is using the correlation between Hasbro's TRANSFORMERS property and commercialized agency "spinoffs" to help students understand how technology developed for space and aeronautics "transforms" into what is used on Earth. Wednesday, Jan. 19 at 11:30 a.m. EST, engineers at Marshall Space Flight Center in Huntsville, Ala., confirmed that the NanoSail-D nanosatellite ejected from Fast Affordable Scientific and Technology Satellite, FASTSAT. The ejection event occurred spontaneously and was identified this morning when engineers at the center analyzed onboard FASTSAT telemetry. The ejection of NanoSail-D also has been confirmed by ground-based satellite tracking assets. Amateur ham operators are asked to listen for the signal to verify NanoSail-D is operating. This information should be sent to the NanoSail-D dashboard at: http://nanosaild.engr.scu.edu/dashboard.htm. The NanoSail-D beacon signal can be found at 437.270 MHz. "The Virtual Observatory (VO) is an international attempt to collect astronomical data (images, simulation, mission-logs, etc), organize it and develop tools that let astronomers access this huge amount of information. The VO not only simplifies the work of professional astronomers, it is also a valuable tool for education and public outreach. For teachers and astronomers who actively promote astronomy to the public the VO is an great opportunity to access real astronomical data, use them and have a taste of the workaday life of astronomers." Full paper. More information. NASA and 14 international space agencies are challenging students to complete a nutrition and fitness program known as "Mission X: Train Like an Astronaut." Approximately 3,700 students from more than 25 different cities worldwide are participating in this six-week pilot project. NASA's Human Research Program is sponsoring the U.S. component of the international challenge that began Tuesday. Teams of students between eight and 12 years old will learn principles of healthy eating, exercise and compete for points by finishing training modules. Students also will practice scientific reasoning and teamwork while participating in hands-on training that targets strength, endurance, coordination, balance and spatial awareness. The exercises will involve the same types of skills astronauts learn during training for spaceflights. The Jet Propulsion Laboratory Summer High School Internship Program (JPL SpaceSHIP) is an 8-week internship designed for high school students, age 16 or older, who have demonstrated a strong interest in and aptitude for science, technology, engineering and/or mathematics (STEM). One of JPL SpaceSHIP's objectives is to encourage pre-college students who have been traditionally underrepresented in STEM fields to consider such fields for their careers. Spaceflight Services (Spaceflight) and Innovative Space Logistics BV (ISILaunch) announced today that they have teamed to create a global spaceflight services provider for small and secondary payloads. 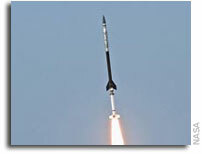 Spaceflight and ISILaunch currently offer spaceflight services on a variety of orbital and suborbital vehicles for small and secondary payloads, with operations centered in the United States (US) and Europe respectively. Under this joint marketing agreement Spaceflight and ISILaunch will provide a global spaceflight service for the launch of small and secondary payloads by jointly marketing a combined set of products and services to prospective customers. Have You Seen This Large Lunar Orbiter "Earthrise" Presentation from 1966? 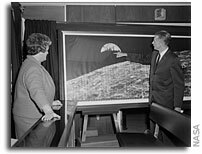 Keith's note: Does any one at NASA Langley Research Center (or elsewhere in/around NASA) know where this large reproduction of the Lunar Orbiter 1 "Earthrise" image (or others like it) are currently located? Please drop an email to lunarorbiter-at-spaceref.com - thanks! More information. Editor's note: I just bought this patch on eBay. Very nicely done. 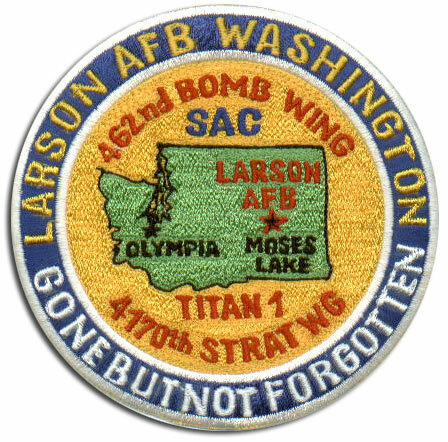 Our Titan 1, Titan 61-4492, was based at Larson AFB, site 568-C2, near Moses Lake Washington in 1962. 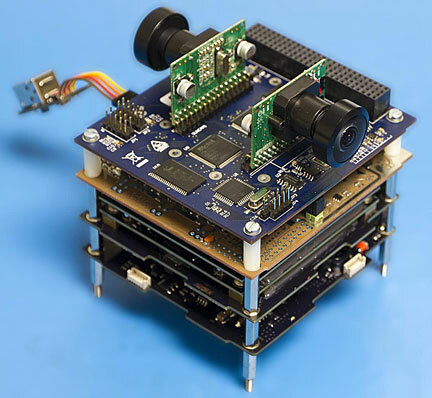 "The team behind Project HiJack envisions users building low-cost sensing and data acquisition systems for student and laboratory use. So far, it has built an EKG interface, soil moisture sensor, an integrated prototype with temperature/humidity sensors, PIR motion sensor, and potentiometer, and a version with a breadboard for prototyping new sensor applications. For decades, NASA innovations have made a direct impact on the everyday lives of citizens. 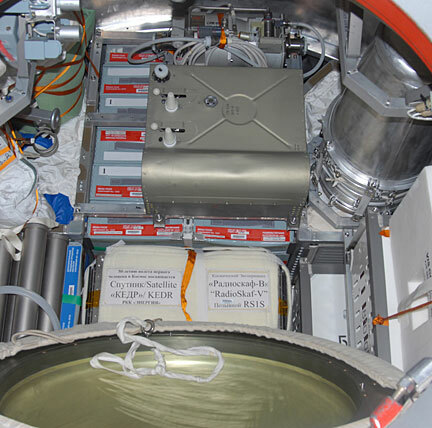 Commercialization of NASA technology has contributed to products and services in the fields of health and medicine, transportation, public safety, consumer goods, environmental resources and computer technology. Since 1976, NASA has featured these technologies in its Spinoff publication. The NASA Spinoff App for Android contains a feed of NASA's latest technology news, a searchable database of NASA-derived innovations, a map of spinoff locations, a historical timeline and a database of NASA's available licensing opportunities to inspire the spinoffs of the future. On Jan. 11, 2011, Google launched the inaugural Google Science Fair. Google has partnered with CERN, National Geographic, Scientific American and the LEGO Group to create this new STEM competition. This is a global competition open to any student aged 13-18, and students may enter as individuals or as teams of up to three. There is no entry fee. Registrations and submissions will be made online. The Science Fair will culminate in a celebratory event at Google headquarters in California in July 2011, where finalists will compete for internships, scholarships and prizes in front of a panel of celebrity scientist judges, including Nobel Laureates and household names. Submissions are due by April 4, 2011. To sign up for free resource kits for your classroom or school, please visit the Global Science fair website at http://www.google.com/sciencefair. NASA is inviting student teams to design and build experiments the agency will fly into the stratosphere, a near-space environment, more than 100,000 feet above the Earth. NASA's second annual Balloonsat High-Altitude Flight competition is open to student teams in ninth to 12th grades from the United States and its territories. Each team of four or more students must submit an experiment proposal to NASA's Glenn Research Center in Cleveland by Feb. 11. Student teams may propose experiments on a wide range of topics, from bacteria studies to weather observations. U.S. Space LLC, a U.S.-based creator of dedicated space solutions for government and commercial clients, and ATK [NYSE: ATK], an aerospace, defense, and commercial products company, today announced the creation of ViviSat, a new satellite life extension venture. ViviSat provides geosynchronous satellite operators with flexible, scalable, capital-efficient, and low-risk in-orbit mission extension and protection services that can add several years to the revenue-producing life of a satellite. Applications are now being accepted for the Achieving Competence in Computing, Engineering and Space Science project, also known as ACCESS. This 10-week, paid internship at NASA centers around the U.S. is designed for undergraduate and graduate students with disabilities. Applicants should have strong backgrounds in science, a GPA of 3.0 or higher, and a desire to pursue technical careers. Students who are chosen will work with scientists and engineers in an area compatible with their skills and interests. Applications for placement at NASA are due Feb. 11, 2011. For more information, visit http://www.nasa.gov/offices/education/programs/descriptions/Achieving_Competence.html. Please e-mail any questions about this opportunity to Laureen Summers at lsummers@aaas.org. Caltech's Summer Undergraduate Research Fellowships, or SURF, project introduces undergraduate students to research under the guidance of seasoned mentors at Caltech or NASA's Jet Propulsion Laboratory. Students experience the process of research as a creative intellectual activity and gain a more realistic view of the opportunities and demands of a professional research career. SURF is modeled on the grant-seeking process. Students collaborate with potential mentors to define and develop a project and to write research proposals. Caltech faculty or JPL staff review the proposals and recommend awards. Students work over a 10-week period in the summer, mid-June to late August. At the conclusion of the project, they submit a technical paper and give a SURF Seminar Day oral presentation. All application materials must be received no later than Feb. 22, 2011. For more information, visit http://www.surf.caltech.edu/. Please e-mail any questions about this opportunity to the Caltech Student-Faculty Programs office at sfp@caltech.edu. 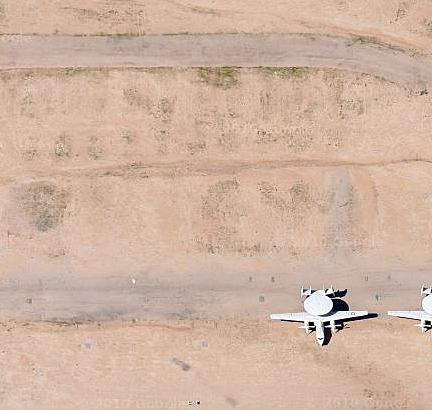 Last year we posted a Google Earth image of Davis Monthan Air Force Base and the Aircraft Maintenance and Regeneration Center (AMARC, A-mark) or "boneyard" where unused military aircraft are stored, restored and/or decommissioned. in Arizona you can see a bunch of Titan II ICBMs lying out in the sun. A newer image has been posted - and it looks like all the Titan IIs have been moved and/or cut up for scrap. "Dear Colleagues: Dr. Bonnie Buratti and I are members of the DAWN science team and we are in the process of generating a photometric model of 4 Vesta in anticipation of spacecraft rendezvous in August 2011. Ground-based photometry of V-type asteroids (Vestoids) over a wide range of solar phase angles would be extremely useful in constraining our model. We have identified three Vestoids that are well-placed for observation during spring of 2011: 1981 Midas, 4668 (1980 WF), and 137052 (1998 VO3). All three are near-Earth asteroids and all three should be brighter than V~18 for a significant portion of their apparitions. 4888 (1980 WF) remains near the ecliptic throughout the apparition while 137052 (1998 VO33) and 1981 Midas will be best observed from the northern and southern hemispheres, respectively. Photometry would likely have to be accurate to 0.1 mag to be useful although more precise photometry (preferably to 0.01 mag) would allow us to subtract rotational lightcurve effects. Introduction: In 1966 and 1967 NASA sent five Lunar Orbiters to photograph nearly the full surface of the moon. 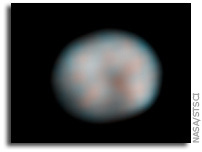 Each orbiter launched took images of different areas of the moons surface, or very high resolution images corresponding to lower resolution images previously taken. Lunar Orbiter Image Recovery Project (LOIRP) is one of the several projects using these images for research. We are in possession of 1,478 2" original analog tapes from 3 Deep Space Network ground stations. We have taken hundreds of those analog tapes and converted them to digital form; with the majority of them being from Lunar Orbiter II which took images with .8 to 1 meter resolution. 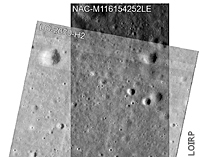 With them in digital form we are able to assemble the framelets in high quality and overlay them with Lunar Reconnaissance Orbiter Narrow Angle Camera (LROC_NAC), which has a similar resolution of .5 to 1 meter. The overlays enable us to compare the two images looking for change, specifically new craters. The finding of new craters will help us determine the age of older craters by looking at the baseline color of the regolith from known dates between the Lunar Orbiter and LROC images. The craters found per unit area will also provide a boundary on the current small body population of the inner solar system. NASA has selected 101 of its high-performing interns and fellows for the agency's Student Ambassador Program. 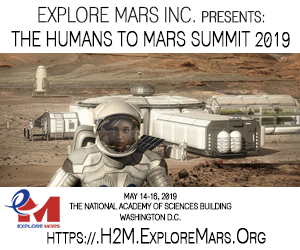 The students will represent NASA at a variety of education and outreach events at schools and universities to help inspire future students interested in science, engineering, mathematics and technology, or STEM, opportunities. Johan H. Knapen: "Both professional and amateur astronomers have been studying the skies for centuries. Their respec- tive roles, however, have changed considerably. In the 18th and 19th century, for instance, one of the main tasks of professional astronomers was to calculate astronomical data to be used by the merchant fleet and the military, and to provide the society at large with important data such as the times of sunrise and sunset and, in fact, time itself. Amateur astronomers meanwhile entertained themselves with what most astronomers might now consider more interesting activities, such as discovering planets and comets, and observing nebulae. Well-known amateurs include Caroline Herschel (1750-1848) who discovered several comets, and her brother William (1738-1822) who discovered Uranus, several moons of that planet and of Saturn, created a catalogue of nebulae (a term used at the time to describe any extended object), and observed double stars. He constructed hundreds of telescopes, and made a number of important discoveries related to light and radiation. Needless to say, amateur astronomers at the time were wealthy individuals. The 2011 Undergraduate Research Associates in Astrobiology Program is a 10-week program for undergraduate students interested in working with scientists whose research adds to the current body of astrobiology knowledge. Each research associate (RA) will participate in a specific research program, working directly with one of our Team scientists at Goddard Space Flight Center. The RA will work closely with the mentor to conduct a well-defined investigation, reduce data, and produce an end-of- program presentation. The presentation will demonstrate the knowledge gained over the course of the summer, and will be given in an oral forum during the last week of the program. As a group, the RAs will meet with a different GCA Team member each week to learn more about his/her respective area of research, and to gain a broader view of Astrobiology.